Nothing beats having a few comforts of home and having a table at a campsite is no exception. Yes, I know you are thinking that one can simply carry a table to where your campsite may be and the problem is solved. While this is true, there are times that carrying a table into the backcountry is impractical. But what do you do? Well, the answer is simple, use what Mother Nature has supplied. Prior to doing though, make sure that you can use the natural resources around you. To begin this process, get your knife out and take a walk about around your camp environment. What you are looking for is a tree with a decent size truck. Next, you will need two branches that will be used to make the length of the table. You will also need two additional limbs that are the same length. These will become the legs of your table. Once you have your limbs cut, the next step in this process is to secure the table frame to the tree with rope. First, what you will need to do is to secure one of the longest branches to one side of the tree and then repeat with the other branch. Next, take the shorter branches and push them slightly into the ground on each side of the horizontal limbs described in the previous paragraph. Secure the “table legs” to the “table top” with a simple square knot. Now, you are ready to create the top of the table. To do this, one will need to take another trip around the campsite. What you are looking for is a lot of branches that are around the same diameter and the width of the table. Do not skimp on this step. The closer the sizes of the branches are the flatter the surface of your table will be. Once you have your branches cut, you will need to lay them out on the “table top.” Now, attach rope in each corner with a square knot and begin to secure the branches to the “table top” using a figure-eight type of wrapping. Take your time when doing this step. You do not want to go to all this work and have your table fall apart. While this table does take time to make and you may feel that you would rather spend time doing other things, I can testify that a nicely constructed table at a campsite is a wonderful addition whether you are spending a night or a week at that campsite. When you are ready to move on, do not forget to tear down your camp table. 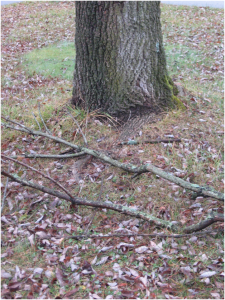 If left up, the rope around the tree will girdle the bark and could kill the tree.